Like most couples, we have our list of favorites. While we love trying new places, at times we tend to gravitate back to our tried and true picks. 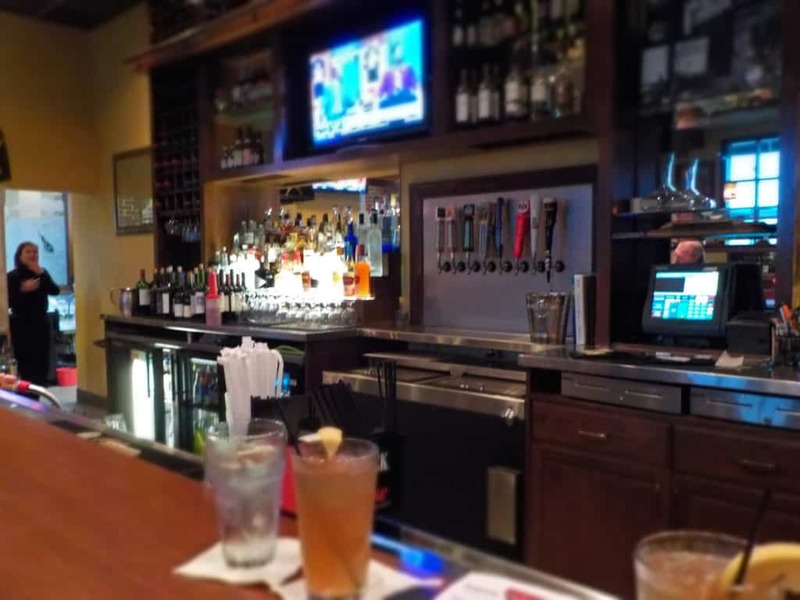 When it comes to a nice Happy Hour, one of our tops is found at the Hereford House at 17244 Midland Drive, in Shawnee. An added bonus is that one of our favorite bartenders, Natalya, works at this location. 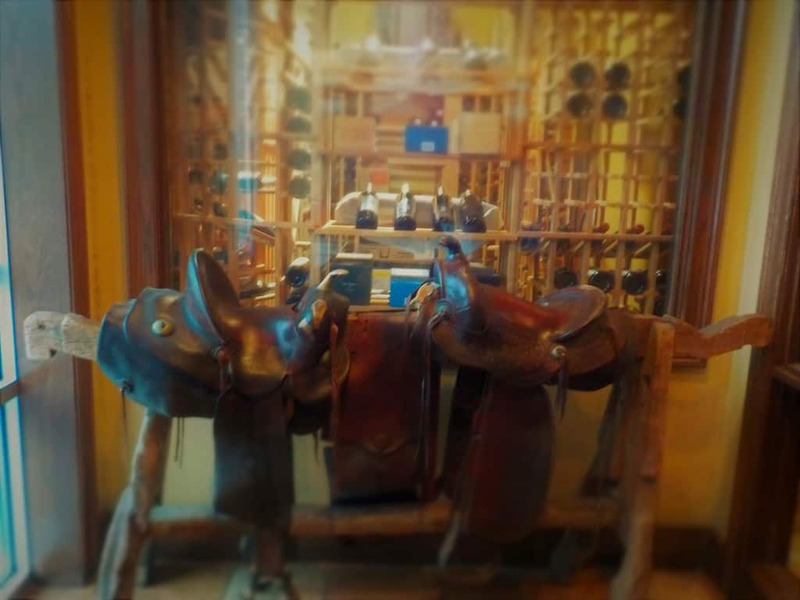 Recently, we stopped by for a Friday evening early dinner to enjoy a little relaxed atmosphere. 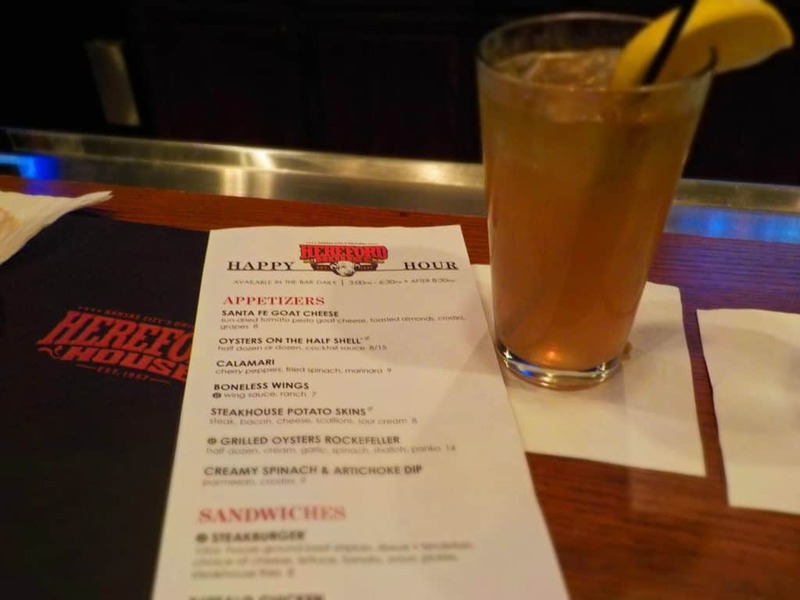 While steak is there mainstay, we find some nice alternatives on the Happy Hour menu. Our standard visit will include a couple Long Island Ice Teas to start with, while we review the menus. We both find Hereford House has one of our favorite versions of this boozy cocktail. One is always enough for us, since this is usually the first stop on an evening of adventure. Sitting at the bar gives us an opportunity to chat with Natalya, when it isn’t too busy. Of course, now that we are sharing this place with everyone, we expect that it will increase the traffic. Oh well, as they say, the more the merrier. The bar area has about a dozen barstools available, so the area can become quite packed around 6:00, which is why we usually plan our visits earlier. There are three television sets, which are always set to sports, and seem to merely be a flashing diversion, since the sound is always turned down. The bar staff has a good grasp on just about any drink you can think of, and it is interesting to watch them ply their trade. I prefer that over the television, and find it more entertaining. One of the advantages of the Happy Hour visit is the meal portions. Hereford House offers up a handful of appetizers at reduced prices, although we rarely order these. We find the entrees to be filling, without the starters. If we were in a small group, these small bites would bee handy to munch on while visiting. 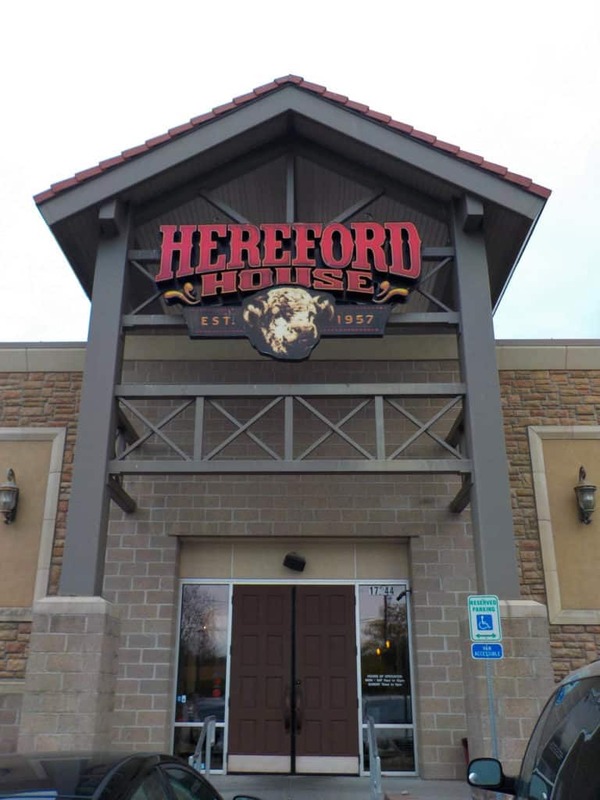 The Hereford House Happy Hour menu has seven entrees to choose from, and all except one costs $10.00 or less. We find these to be a good bargain considering the quality of the dishes. I believe we have sampled every entree on the menu, and now we usually select one of a few of our favorites. This evening I decided to have the Fish and Chips, which comes with a serving of their steak fries. 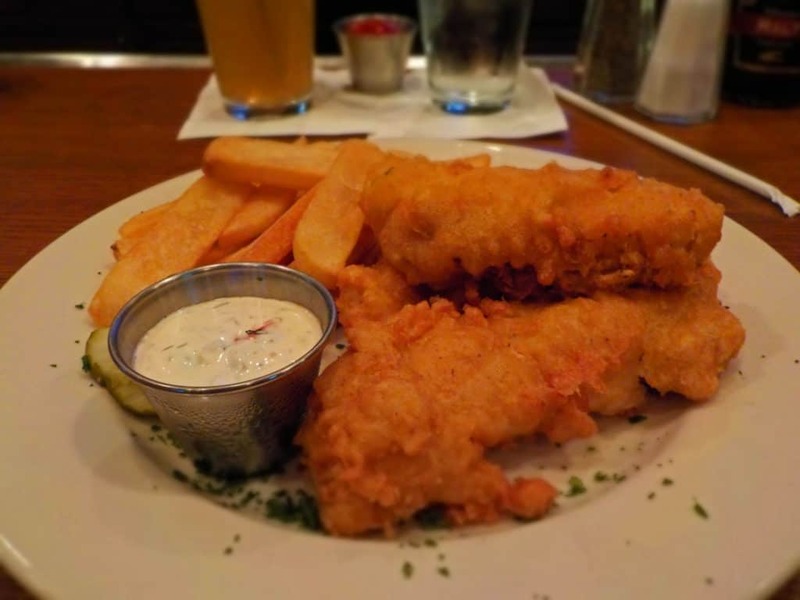 We both enjoy the Boulevard beer battered fillets, which come in a trio with the house made tarter sauce. It always comes out piping hot, and it’s difficult to start slowly when I smell them. Fortunately, Natalya is more than willing to bring us extra tarter sauce if the need arises. In a switch from our usual, Crystal was the one dining on beef this evening. 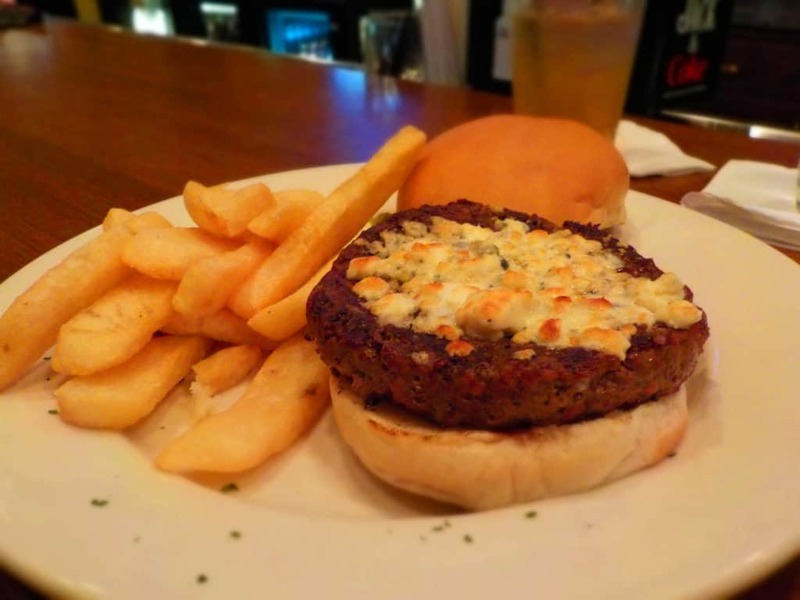 Hereford House offers a 10 ounce Steakburger, that is really made with steak cuts. The meat for the patties is a mix of ribeye and tenderloin, and has amazing taste. On this occasion she chose the blue cheese topping, and as always the lettuce, tomato, pickle, and onion are on the side. I realize that they don’t show up in the picture, but that is because the burger is large enough to block them from view. Like my meal, Crystal’s came with the steak fries as the side. As we dined, a conversation was struck up with a group nearby, and it was obvious that they were also regulars. I guess the word is already out about the Happy Hour, and now we will have to arrive even earlier. Perhaps we will see you there one of these times. If so, be sure to say Hi!